What a great "just because" gift idea for that bird lover in your family! These are adorable ... and don't let the photo fool you, these are good sized stuff birds! The birds themselves measure (from head to tail) almost 16" long and are almost 8" wide. 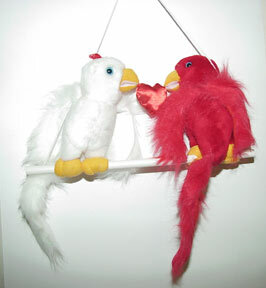 The "perch" is 17" wide and from the top of the rope hanger to the perch is about 15". 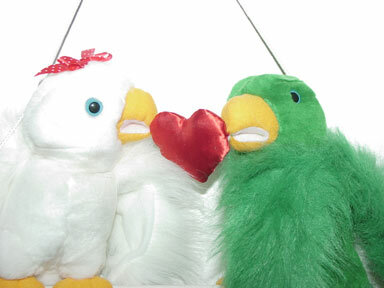 They come in red or green (boys) and the girls are white (you can tell the girl by the bow in her feathers).